Milton, 25, has been working as a part-time doorman in a Greenwich Village rental building for the past 3 ½ years. It is his first job as a doorman. Here’s what he had to tell us about resident mood swings, off-the-books services and what makes someone a nightmare tenant. How did you become a doorman? A family friend introduced me to the super and the super liked me, so I got the job. What kinds of qualities do you think are important to succeed as a doorman? You have to be presentable, clean-shaven — the average man could do the job, it’s not hard. What is the most exciting or interesting part of your job? (Grinning) The tenants’ mood swings. What are some of the weirdest mood swings you’ve seen? The Saturday night drunk ones where they slip and fall. You try to make them feel comfortable and not embarrassed. Is that the most challenging part of your job? If not, what is? Just making sure you’re doing the right thing….that and no cell phones are allowed. Staying off the cell phone is the hardest part of the job. What makes someone a good tenant in the eyes of a doorman? Greet us – that’s all we ask. Sometimes the tenant will walk by and not even say hi or good morning. That’s not polite – at least that’s not how I was brought up. What makes someone the worst possible tenant? That — not greeting. There are some tenants here that still don’t greet. Does a tenant ever ask for something that’s not in the job description? Where does a doorman draw the line? We just speak with the boss – my super. What are some of the things that tenants have asked for? Sometimes they ask for us to clean their apartment windows and that’s not in our job descriptions. If it’s ok with the super we charge them a separate rate that most of them agree to. Do most doormen take money for extra services? Sure – window cleaning, dog walking – nothing too crazy. What kind of tips do you expect at Christmas? Anything is ok with us but anything extra is a beautiful thing. What’s one of your strangest or most striking memories as a doorman? I haven’t really handled strange situations yet. Maybe a leak that happens and it’s 12:00 at night and you’re like, who’s going to help me at 12:00 at night? I get in contact with the super, call a 24-hour plumbing company – that’s the strangest thing that’s happened here. I guess that’s a good thing. So, as one relatively new to the profession, what advice would you give to someone who wanted to become a doorman? You’re not going to grow standing a lot. We do a lot of standing here. It does. It wears on your knees but still, you gotta do it. 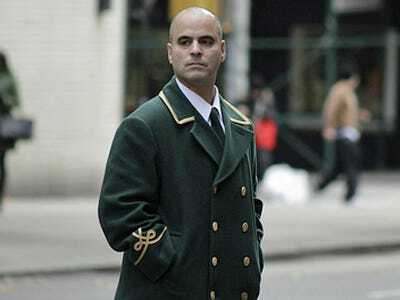 Tips from a Doorman features interviews with assorted New York City doormen, in an effort to get the inside scoop on the intriguing life of a Big Apple doorman. Because in New York apartment buildings, doormen don’t just open the doors – they pick up your packages, keep track of your friends and family, and they sometimes keep intimate secrets.